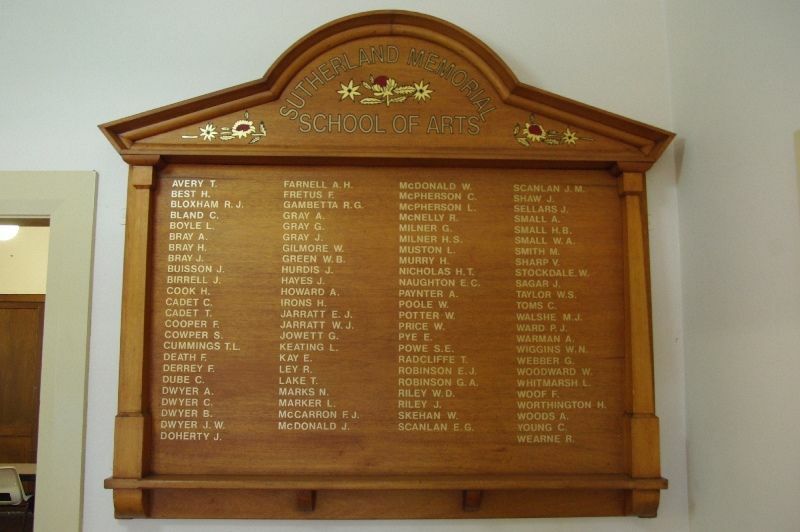 The Honour Roll commemorates those from the district who served in World War One. The roll was unveiled at the opening of the Memorial Hall in 1922. The official opening of the Sutherland Memorial School of Arts will be performed by the Hon. Albert Bruntnell, Minister for Education, on Saturday, 5th August, at 3 p.m. He will at the same time unveil a beautiful Honour Roll erected in the building and containing 93 names of soldiers who enlisted from the Sutherland township area. As the building has been erected as a fitting tribute to the gallantry of our boys, they have now been made honorary life members of the Institute. It is hoped that the public will turn out 'en masse' on Saturday to do honor to the boys who fought for us in the Great War. St George Call (Kogarah, NSW), 4 August 1922.